My September Faves- Featuring Trinket Avenue! Tonight I thought I'd share with you a few of my September faves, aka all of the things I have somehow managed to splurge on despite being only 8 days into the month (oops!). Hope you like! First up is this oh so beautiful playsuit that I purchased from the Oh my Love London concessionary stand at Topshop! 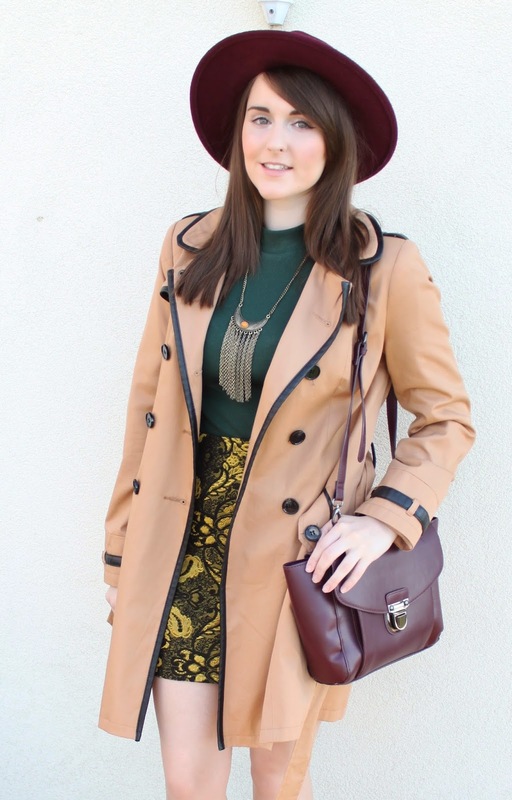 The darker floral print & earthy accessories make it perfect for Autumn wear :) The brown Fedora hat is also a lovely new addition to the collection (and was just £7 THANK YOU Primark)! So just because we're moving onto colder times doesn't mean we can't bring some bright pastels with us into winter! Well that's what my thought was anyway when I purchased this pastel blue beauty from Asos last week! I just love it and I have a feeling it's going to be the first of many winter coats to grace the winter wardrobe! Size wise I'm usually an 8-10 but went for the 8 and it fits perfectly - hope this is useful for any of you ladies who are in-between sizes like me! Whilst browsing Topshop I came across their range of halter neck crop tops and decided (I needed) to have them in a few different colours - you can never have too many basics! 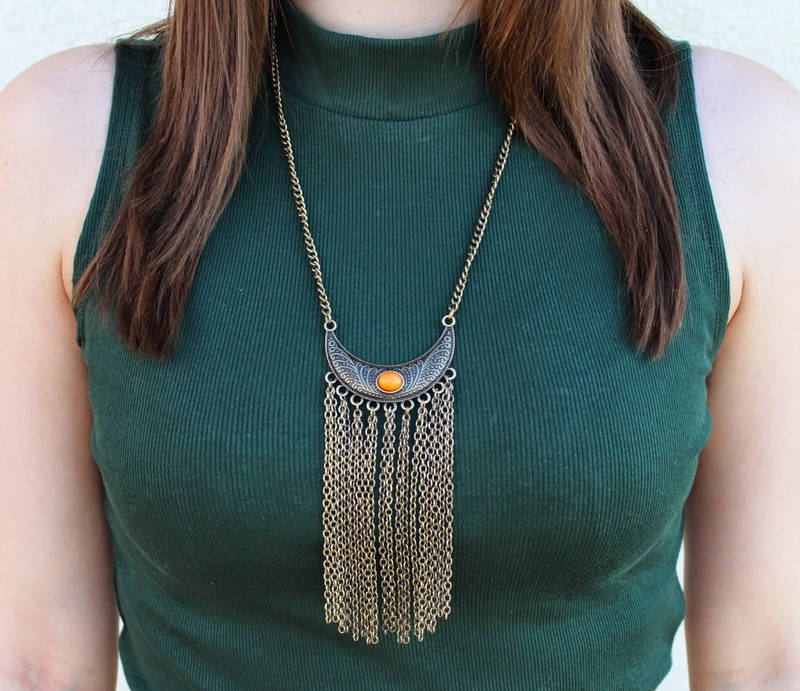 I thought the deep green went perfectly with this super stunning tassel necklace I received from Trinket Avenue. I own quite a few pieces of jewellery from there now and they are all brilliant quality and of course look amazing! I would recommend to anyone who is looking for some unique jewellery pieces without wanting to break the bank - check their website out here! I've been loving all these "I look like a co-ord but i'm secretly a dress" pieces that have been popping up everywhere - and when I saw this lovely red one on Asos I knew I had to purchase! It's made from quite thick material which means it will be perfect for a meal out on a chilly night! No outfit is complete without the accessories and every time I go to Primark recently I seem to leave with a new bag! Their autumn/winter range is just amazing! My favourite is this black and gold across body bag with the adorable bow detail! Love the playsuit from Topshop. Thank you hun! It's my favourite atm! Amazing outfits! I really love the third one. Love all the outfits! Btw, i've just followed you on google plus! Love your style! Aww thank you Maria - that's so sweet!! I am seriously obsessed with the first outfit!! The romper and hat look perfect together!! I really wish I could go shopping in London haha you find the cutest things! ^ PS thanks again for showing me how to put the link!! Aww no problem chick - any time! Love that I could help someone all the way in New York!! Thanks Eleanor! I'm going to wear it to death this autumn haha! fab items doll! love the print on the playsuit! I love all your outfits but especially adore the printed playsuit, looks fantastic on you! Aw wow thank you sweetie! 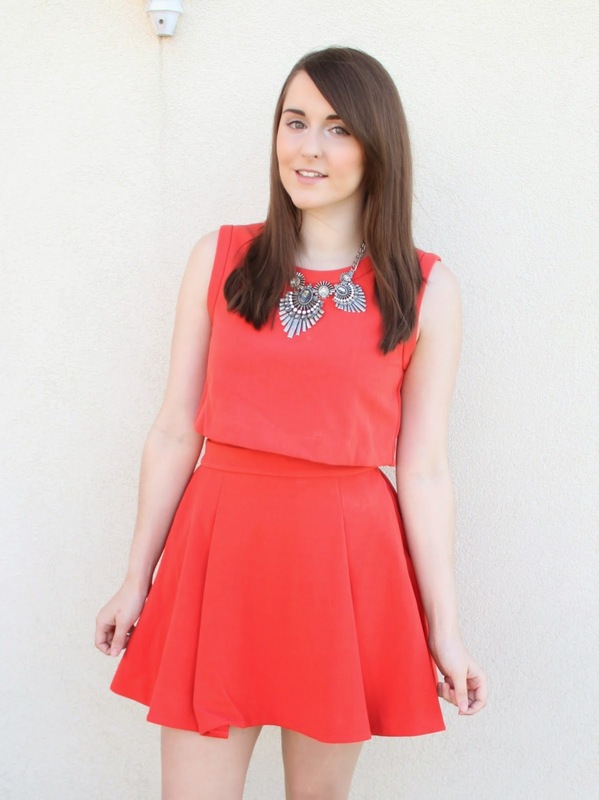 Love all of these looks, but especially the playsuit and then that red dress! Thanks Shannon! The dress is my fave too! Aww thank you - you're far too kind! I am loving all of this! Especially that black and white number, it's spectacular! Beautiful outfits. The red dress is absolutely gorgeous on you! Beautiful! I absolutely love your picks! That Jumpsuit is so Pretty especially the print <3 !!! 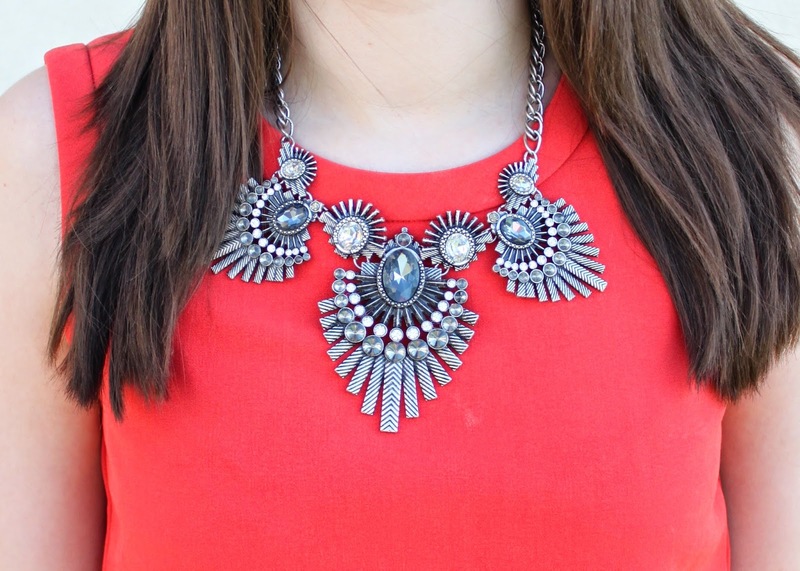 Glad I found this blog, loving your style Girlie! Aww thank you so much! You're super kind! I love all of your outfits! My faves are the first two. Your second outfit looks vintage! It's perfect. My Favourite Budget Autumn Items, Part 1!